Find out what your child already knows about the song's target concept. 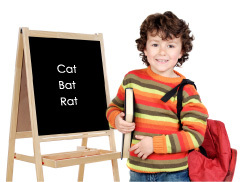 Examples: rhyming words, capital letters, short vowel sounds... by pointing to the words or letters on the Mini-Charts. Ask questions such as, "Can you tell me what letter this is?" or "How does this letter sound?" or "What is alike in these words? What is different?" Examine and discuss the words or letters on the Mini-Charts before singing the songs. If using Ready-to-Read for a child who is not yet reading, focus on the target sounds, rather than the print. For example, see if the child can tell you which words rhyme while you read the words. Or see if the child can tell you what sound is repeated at the beginning of each word that you read. If your child is unclear about the concepts covered in the song, explain and demonstrate the target concept, pointing to the Mini-Chart. Examples: "This is a capital A--see how it goes up and down like a teepee." "These words all have different letters at the beginning, but they have the same ending letters." If using Ready-to-Read for a child not yet reading, show your child how to tap on the rhyming words, how to form his mouth for the repeated sound, or whatever is being asked of him/her in the song. Begin by listening to a portion of the song recording while pointing to the each example on the Mini-Charts. Ask questions to check for understanding of each example in the song. If this goes well, encourage your child to join in the singing on the repeated parts of the song. Do this yourself, as well. Repeat previous steps, if your child is unsure of what to do. Play the recording several times a day until your child can sing the whole song with the recording, pointing to the appropriate parts of the Mini-Charts each time the song is played. Divide up parts of the song among, with you singing some parts and your child singing other parts. Ideas for dividing up song lyrics, adding hand/body motions, and reinforcing through games can be found in the Teaching Suggestions Booklets. Add hand or body motions to reinforce learning and to add interest and engagement. Use the instrumental recordings of each song to check for retention of concepts. If your child can sing the words and point to the charts (or perform the motions) without assistance, s/he is ready to expand the concept to other related words. Help your child to generate other examples of each phonics concept and create your own Mini-Charts by using the Templates at the end of the Mini-Chart booklets. Sing the song with your own examples. For songs that have letters, rather than words, try changing the order of the letters in the song. For example, in the Vol. 1 song, Oh, Do You Know, start with short u, instead of short a. Make a word wall with examples of targeted words or letters in each song. Encourage your child to look for and listen to books, poetry, and environmental print for examples of each phonics concept as well as exceptions. Help your child develop a phonics notebook divided into ten sections, one for each song in the series. Have him or her label each section with song title and phonics rule. As examples are found, they can be entered into the appropriate sections of their notebooks. Play games such as Concentration to reinforce each song’s concept. Check our online Lesson Plans page for additional things for your child to do before, during, and after singing the songs.